Begging to make a sale?? Earlier this year, my posts re: the purse carrying habits of designers and testers somehow morphed into an in-depth discussion of how difficult it is to try to sell our handmade bags (and I suppose, handicrafts in general) — whether online or in markets. For those who have been following along those posts, I am actually still waiting for input from a few people (who have probably forgotten that they promised to give it to me — LOL), but in the interim, I reached out to someone who seems to have found some success at the selling game: Norma, who blogs at Norma's Bag Boutique. First of all — and this is where most of us will be stopped in our tracks — her collection of items for sale is to be envied. As of this writing, Norma has over one hundred items in her shop, making it very browsable. (When you physically go shopping, would you ever be tempted to step into a store that only has one shelf of merchandise in it? No. First lesson of successful selling: sufficient inventory.) Oh, and she has also sold over one hundred items, dating back to 2012. But even if you create like crazy and your shop is filled to the brim, does that ensure success? If you sell at markets and craft fairs, you have to find the right ones. My own market friend tells me that not all markets are equal. (Not a surprise.) If you end up at multi-purpose farmers' or flea markets, you will likely encounter more difficulty than if you set up at markets that are exclusively for crafters. Generally speaking, the customers at the latter are more apt to pay what you ask. Ah... paying what you ask. There's that prickly price point thing again! We all value our time and think that we should charge appropriately for it, but the truth of the matter is that it is virtually impossible to charge anything remotely resembling "minimum wage" when it come to pricing our sewing projects. So you need to find that "sweet spot" of compromise... a price at which you are able to ensure that you can continue crafting (by buying materials) and that the purchaser is willing to pay. I think Norma has established a sensible pricing strategy in her shop. To be totally honest, I would be more willing to pay what she's charging for her unique handmade items than pay the same for similar mass produced items. Norma's take on the pricing predicament? "Pricing might be a bit tricky. I might not be the best [at] putting a price in what I do. I just have to keep in mind that I'm not creating something for people who don't value my work and want things very cheap. Those can go to stores and buy mass produced bags. I'm creating for people who value handmade and appreciate the uniqueness and quality of my purses. I always like to create a balance on my prices as to be fair with myself and also with the customer." How did Norma get her start in the bag selling biz? "Before I started selling my bags I used to create with polymer clay and sell my creations. I was participating at 5 or 6 great craft fairs a year. That’s when I opened my Etsy shop that was previously called Norma’s Clay. I didn't sell much at the shop but at craft fairs I was doing well. It was enough to cover the hobby/business and have a little extra. I'm glad I didn't have to pay the bills with that. Then my passion for sewing bags was born and I just changed the shop's name to Norma's Bag Boutique. Let me tell you that these bag pattern designers I test for have been my teachers on learning bag sewing techniques. Yes, I've been sewing since I was a girl, but I used to sew mostly apparel. So a big thanks to them." So we have established that inventory, pricing and probably having a pre-existing following (re: Norma's past history at craft fairs and her clay shop) are important factors for successful online selling. Even at that, how well does it go? 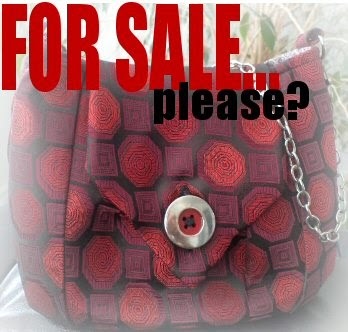 "Selling the bags I make is not so easy. But something has to be done with all these bags!! And how am I going to buy more fabric and materials?! LOL. The truth is the business part of it needs time and dedication. Creating is what most people like but not the "spending time with the business part" so much. It requires a lot of patience and work. I like to offer something that has high quality and that will make the client happy. I like to make people happy in general. I love reading the feedback I get after a sale. It makes me happy when they are very satisfied with the purse.... I don’t sell many bags a month but is enough to keep the ball rolling for now... The shop is always a work in progress. I'm also a work in progress!! But I hope it works well and the shop starts doing a bit better soon." The bottom line is that there is no secret to the successful selling of handcrafted goods. It's just a lot of common sense and hard work and — one aspect that we haven't yet covered — a willingness to market oneself in whatever ways available. In the absence of the latter, you may never get noticed. I recently ran across an online quilt shop where the crafter has devoted herself full time to making it her living, having left what I presume was a well paying career. It is obvious that a good amount of money has been spent on making the online presence appear professional... it looks sharp. However, this person has dropped the ball on virtually everything else. All three of her social media streams — blog, Twitter & Facebook — suffer from lack of recent updates. Her Etsy shop has a reasonable single page of items in it, but pricing is high for a start-up. (A quilted throw pillow is priced at $500 US.) Have there been any sales? Significantly under a handful. Sadly, this is a business that seems stuck at mile zero. I just did a search for "homemade quilts" on Etsy and on the first page, found prices ranging from $42 to $1,200 (US; that latter amount is over $1,500 right now in CDN!). Now, even as a non-quilter, I understand that materials, design and workmanship play a large part in the "value" of a quilt, but there is really no way — even if I had twice Bill Gates' money — that I would ever pay several hundred dollars for a quilt. (Yes, fortunately that's just me — hopefully there are others out there who might, or the world's quilting market could be in jeopardy.) All I'm saying is, it's one thing to want to make enough from selling your wares to sustain your hobby; it's quite another to attempt to make enough for a year's worth of materials out of one sale. And of course, after this extended discussion, we bag makers who don't have a hundred bags to sell are still in a pickle... where and how do we get rid of our one-off bags?? While you ponder that dilemma, maybe go take a look at Norma's lovely wallets and bags in her Etsy shop. Rochelle this is a great post. I just went to a local sewing and craft vendor show. I had to pay to get in the show and they also charge for parking, so right off the bat I spent money. I was amazed at how expensive the tools, notions and fabrics are! I am a quilter and a bag maker and what it costs just to buy a kit for making a quilt (or a bag) that includes the fabric and instructions (but doesn't include the quilt batting or backing) can cost well over $100 for a wall size quilt. So only others who sew can appreciate the cost involved in making a quilt. Trying to sell quilts or bags, etc. to those who have no clue what the materials cost, let alone the labor, will probably never buy what you sell, unless they do have money. Bed size quilts made with quality materials will cost several hundred dollars in materials alone just to make the quilt. If the "piecer or appliquer" sends her quilt out to a long arm quilter to get quilted adds a lot more to the cost of making a quilt. Because the cost of quilting a king size bed quilt top can cost $150 and up and that's just for the cost of quilting the quilt! So if you want to sell a bed quilt, you have to charge hundreds or over a thousand dollars. It's very labor intensive and with cotton fabrics now costing $12-15 a yard it's an expensive hobby! You need about 8 yards of fabric for the backing of a king size quilt plus another yard for the binding. And that's just for the back of the quilt. The top takes even more because you cut up several fabrics. So you can do the math and see how pricey quilts can be just to make. It would be too hard to sell them. It has to be a labor of love to make quilts whether you sell them or not. I have sold a few small wall quilts. I mainly get my material cost back a a little more. Same with selling bags, Since I test bags too, I will sell them pretty much for cost in order to sell them. If I charge much more than material costs, I rarely sell them. I know you must self promote, but that's just too time consuming and takes away all my creating time. So I found a small shop to take a few items each month and I can do what i love to do without having to sell it myself. Thank you for the explanation re: the cost behind making a quilt. (It seems insane to me to venture into selling them for a living, then.) I like your idea of selling product through a local shop. Appears to be a win-win situation without taking you away from what you most like to do.